Twin 5.7 Liter, V drive, all the goodies to make your time on the water special. Heat and A/C, two refrigerators, generator, anchor and all chain windlass with remote. Beige interior and dark Cherrywood tiger stripe cabs, beige corian countertops, can sleep six, Vacuflush head, transom shower and bathroom shower. Hot water, two burner stove, microwave, tv/vcr, am/fm/ cd with 6 disc changer, six speakers and one sub (and 1000 watt amp for amazing music), wet bar, VHF radio, tilt helm, adjustable helm seat, exterior carpet, wine chiller. Beautiful boat, extremely well cared for, never been in salt water, under a covered slip at the Boardwalk Marina. Tan sunbrella canvass and white vinyl outside seats. 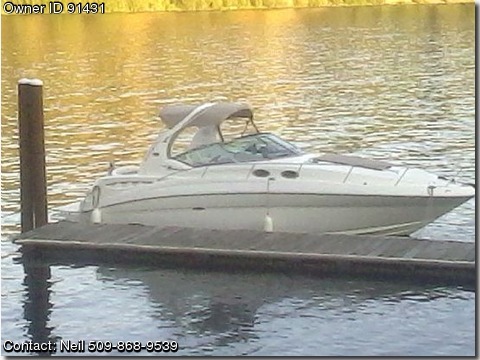 Call for details, this boat is loaded with extras (as most Sea Rays are) and handles like a dream. 36 feet total including the oversized swim platform and a wide 11.5 foot beam for comfort and extra room.